Most Americans believe Russia was behind the hacks of the Democrats during the 2016 presidential campaign. But they are divided on whether to impose further sanctions on Russia, beyond the steps President Barack Obama took last month. An overwhelming share of the public (88%) has heard about allegations that Russia was involved in hacking the Democratic National Committee and Hillary Clinton’s campaign. Among those aware of the allegations, 72% say Russia was definitely or probably behind the hacks, compared with just 24% who think it was definitely or probably not involved. When asked how the U.S. should respond, nearly half (46%) of those aware of the hacking allegations say the sanctions already imposed on Russia are about right, while 27% say they do not go far enough and 20% say they go too far, according to a national survey released today by Pew Research Center. Democrats are far more likely than Republicans to attribute the cyberattacks to Russia and to favor further sanctions on Russia. More broadly, Democratic views of Russia – and its leadership – have worsened considerably over the last few months and years, while Republicans’ assessments have grown more positive. Democrats and Democratic-leaning independents who are aware of the allegations are nearly united in thinking that Russia was behind the hacks – 93% think it was Russia, including 57% who say it definitely was. By contrast, GOP views are more divided: About as many Republicans and Republican leaners think Russia was not behind the cyberattacks (47%) as say it was (48%). Democrats are also more likely to support the sanctions and actions taken against Russia as a response. 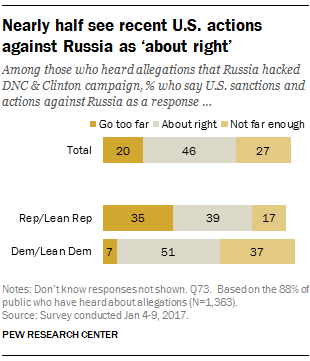 Among those who have heard about the allegations, 51% of Democrats view the response as about right, while 37% say the sanctions and actions do not go far enough and just 7% say they go too far. By comparison, about a third of Republicans (35%) say the sanctions and actions against Russia go too far, while 39% say they are about right and just 17% say they do not go far enough. But for the first time in Pew Research Center surveys dating back to 2008, Democrats are significantly more likely than Republicans to view Russia as a geopolitical adversary. And even as Americans’ views of Vladimir Putin remain deeply negative, there is now a partisan gap in these opinions. About four-in-ten (38%) Democrats and Democratic leaners now consider Russia an adversary, while about as many (42%) call it a serious problem, and just 17% say it is not a problem. By contrast, only 20% of Republicans and Republican leaners call Russia an adversary, while 45% say it is a serious problem, but not an adversary. Nearly a third of Republicans (32%) say that Russia is not a problem. This marks the largest share of Democrats that have considered Russia an adversary, and among the smallest share of Republicans saying this, in surveys dating back to 2008. In fact, Republicans were more likely than Democrats to view Russia as an adversary as recently as last spring. And while Putin remains an unpopular figure among the U.S. public, with just 19% of Americans viewing him favorably and 69% giving him an unfavorable rating, fewer Republicans now express dislike of the Russian president than in the past, while the share of Democrats with an unfavorable impression of him has increased. Currently, 27% of Republicans and Republican-leaning independents have a favorable view of Putin, up from just 11% two years ago. 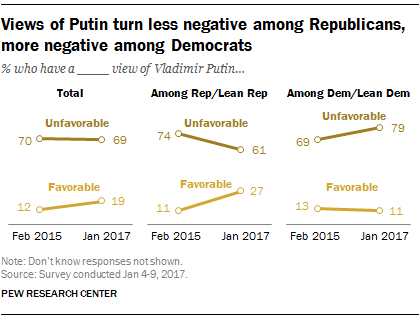 By comparison, 11% of Democrats and Democratic leaners view Putin favorably today, little changed since February 2015, although the share of Democrats viewing Putin unfavorably has risen from 69% then to 79% now.